This content was produced by The Foundry @ Meredith Corp. Martha Stewart Living Online editorial staff was not involved in its creation or production. Win $10,000 to redecorate your bills! Making a lamp sounds hard—right? (Wrong!) Here’s a secret from DIY experts: You can get the classic look you want using pre-fab materials and you will never know the difference. The more pre-fab items you use, the easier your task. Take this cool retro floor lamp; With its handmade look, you’d never guess how easy it is to create. And when you add Philips Classic Glass LED bulbs, you keep that classic look, with LED light performance. Where do you start shopping? The plumbing and pipe aisles of your local home supply store. For this lamp, your hands can do most of the work; just a few basic tools are required. Plus, if you get stuck along the way, our quick video offers some helpful insights. The result is a fun, budget-smart project that helps you light the spaces you love. You’ll find all of these pre-made pieces in a DIY home improvement or hardware store. Note: All pipes should be ¾” in diameter and either iron or steel. Once you figure out how the pieces go together, they simply screw into one another—it’s really that easy. Twists and turns are all it takes to connect the lamp base elements to one another. 1. Connect two ½” x 8” pipes using a 3/4” threaded T pipe. 2. Attach one ½” threaded T pipe to each of the free ends of the 8” pipe piece. 3. Using a pipe connector, connect an elbow to each free end of the ½” T pipes. 4. Screw one 24- or 30-inch piece of 40-cut pipe into the middle of the T pipe. You now have the base of the lamp; it looks like an extruded letter “H” with a pole that serves as half the vertical piece of the lamp. 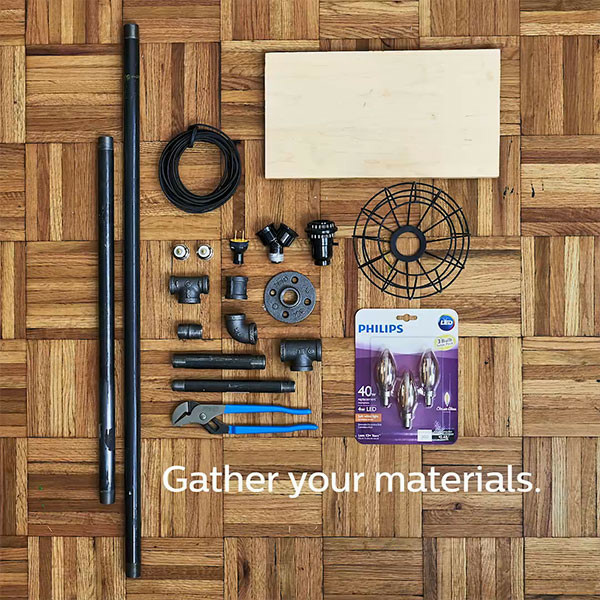 Here's the spot where you can put your budding DIY skills to use. All you need is a screwdriver (a battery powered one makes it easier but a hand-powered one works fine, too). 1. Gather one 3/4” threaded T pipe, one ½” x 6” pipe, one elbow, one pipe connector, and one floor flange. 2. Assemble those pieces in that order to create an arm for the shelf. 3. Place the wood plank on top of the flange. Using 3/8” screws and a screwdriver, attach the flange to the bottom edge of the wood plank. 4. Using one end of the T pipe, connect the lamp arm to the lamp base. 5. Using the other end of the T pipe, connect the remaining piece of the 24- to 30-inch pipe to the lamp. 6. On top of this piece of pipe, attach the 1-inch coupling. Inside every electric plug or socket are detailed directions about which wire goes to which connector, and most require a simple tightening with a screwdriver for a secure connection. But read the how-to thoroughly before you start so you understand the process. 1. Thread the lamp wire through the vertical pipe pieces of the lamp. 2. Using the manufacturer directions, attach the 15-amp plug to the bottom end of the wire. 3. Attach the lamp shade to the lamp. 4. Using the manufacturer directions, attach the socket to the top end of the wire. 5. Insert the lamp holder adapter into the socket. 6. Insert the candelabra adapter into the lamp holder adapter. 7. Insert two Philips Classic Glass LED Bulbs. 8. Plug in, turn on, and enjoy! This lamp with Philips Classic Glass LED bulbs will give you that classic look you love, and the quality and performance you expect from LEDs, all in a project you made on your own. 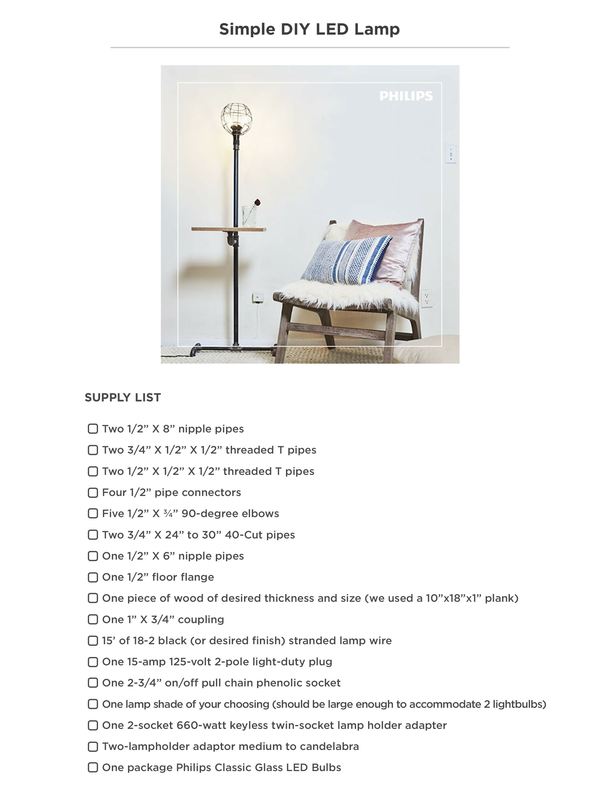 View or print complete supply list here. © Copyright , Martha Stewart Living Omnimedia, Inc. All rights reserved.